Using a modern radar set, you can observe your surroundings in daylight or darkness, through fog, snow and rain, 24 hours a day, 365 days a year. Other navigation systems, such as GPS and Loran C interfaced with chart plotters, will tell you immediately where you are in relation to land and other permanent features, but they don’t tell you about transient phenomena, such as other boats, barges, floating obstructions, etc. Radar is the only navigational aid that not only helps you find out where you are, but shows you where everyone else is too. Using radar you can observe a dynamic, changing situation in real time in zero visibility and darkness, yet navigate with confidence and safety. In other words, having a radar set is almost like having x-ray vision. Yet many boaters find radar displays hard to interpret and, consequently they fail to use their equipment anywhere near its full potential. Of all the navigational aids available to the recreational and small commercial boater, radar requires the most interpretation in order to be used successfully; but once mastered, radar is the most valuable of them all. This book will help you understand how your radar works, so you can properly control and interpret the information it provides, as well as teach you the techniques for navigation, blind piloting, and collision avoidance, so you can get absolutely the most out of your set. In The Radar Book—Effective Navigation and Collision Avoidance, Captain Kevin Monahan, presents the complete picture on how to maximize the use of a marine radar system for collision avoidance and navigation. Through the use of practical examples, copious illustrations and actual radar images, the newcomer to radar as well as the experienced mariner will learn how to tune a radar system, interpret the display under real-life conditions, and take advantage of all of the built-in features and functions to use radar effectively as a real-time navigational tool. The book also includes extensive discussions of today’s next generation radar systems, combining radar with electronic chart and automatic target plotting technology, as well as tips and recommendations for the purchase and installation of a new system. In the entrance to Victoria Harbour, the Ogden Point terminal breakwater is ahead and to port. The terminal itself is directly to port. The image is blurred and difficult to interpret. In addition, side lobe echoes have cluttered the view of the channel astern. On exiting Victoria Harbour, the Ogden Point cruise ship terminal is abeam to port. 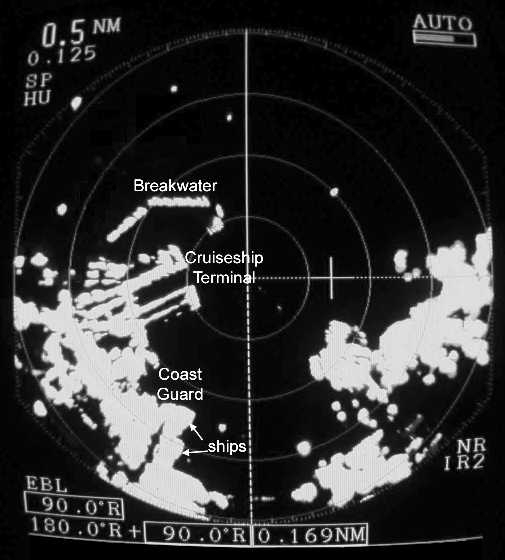 Note that even though the radar is operating on short pulse, the images of the docks and warehouses lack definition and "side-lobe echoes" and other interference have cluttered the view of the channel astern. The same location viewed with "anti-Rain Clutter" control applied. In this image, the Ogden Point cruise ship terminal can be seen much more clearly. 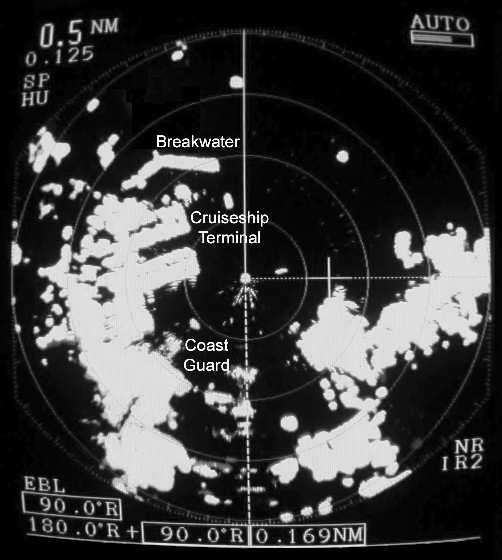 The radar shows each dock as a discrete target. In addition, two ships can be seen alongside the Coast Guard base at the lower left. Targets on the display are clearer and more easily identified. Sidebar: How close is too close? Sidebar: Am I Going Crazy? 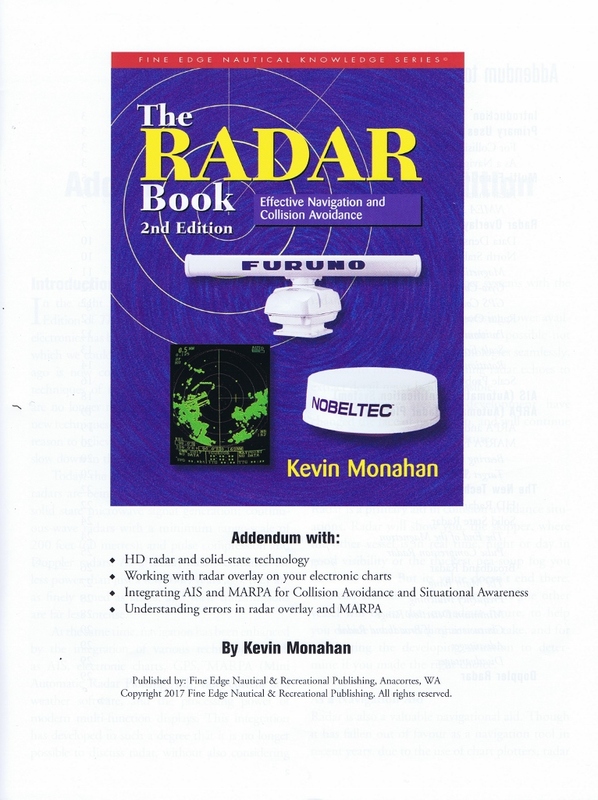 In straightforward, easy-to-follow steps, supplemented with copious examples, this book takes the reader from the basics of radar to advanced techniques. The new radar user will welcome this book, the experienced user will appreciate it. Both will learn from it. This is the most significant, easily understood publication regarding radar which we've read in the past 24 years. It is a "must have" book.